A complex of digestive enzymes that helps support the proper balance of enzyme activity in the digestive system. The complex contains the seven most essential enzymes for breaking down the common foods in our everyday nutrition. 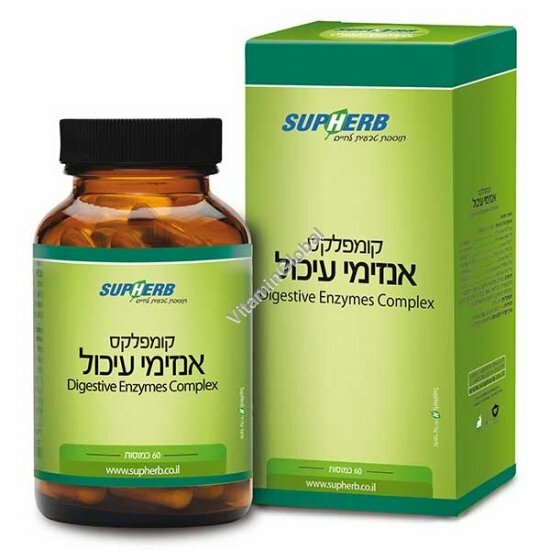 Taking digestive enzymes is the most effective solution for easy and proper digestion. Ingesting a daily supplementation of digestive enzymes helps eating without worrying about the common side effects after meals such as the feeling of fullness, swelling, gases, stomachache, constipation, diarrhea and more. Furthermore, taking enzymes that aid in the proper digestion of food is essential for preventing diseases since the lack of enzymes hampers the body’s metabolic actions, and could lead to the development of various diseases, not only in the digestive system. A well-known example is that proper digestion of proteins is essential for the prevention of allergies, which cause asthma and eczema. Instructions for use: 1–3 capsules daily, with meals. Available in packages of 60 capsules. This product is not a medicine and is not intended to replace medical treatment. The information above is not controlled by the Ministry of Health.